Shallow lowland lake describes the depth and location of the lake in a watershed. These variables affect the lakes response to watershed variables. 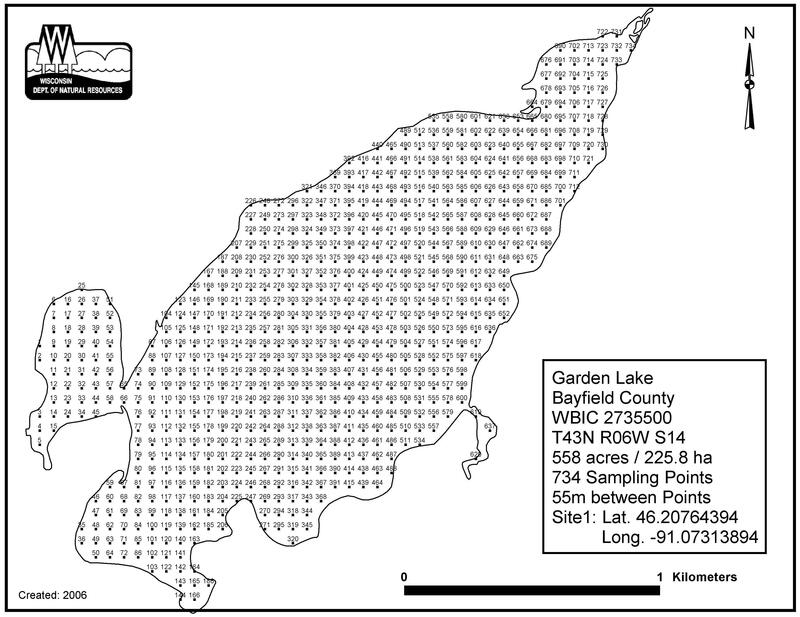 Garden Lake, in the Upper Namekagon River Watershed, is a 557.93 acre lake that falls in Bayfield County. This lake is managed for fishing and swimming and is currently not considered impaired. Garden Lake (2735500) was assessed during the 2016 listing cycle; total phosphorus sample data were clearly below 2016 WisCALM listing thresholds for Recreation use and Fish and Aquatic Life use. Chlorophyll sample data were clearly below FAL use listing thresholds and did not exceed REC listing thresholds. This water is meeting these designated uses and is not considered impaired. Garden Lake is located in the Upper Namekagon River watershed which is 197.80 mi². Land use in the watershed is primarily forest (74.10%), wetland (16.70%) and a mix of open (4.60%) and other uses (4.70%). This watershed has 135.34 stream miles, 6,298.06 lake acres and 19,026.69 wetland acres. This watershed is ranked Not Ranked for runoff impacts on streams, Not Ranked for runoff impacts on lakes and Low for runoff impacts on groundwater and therefore has an overall rank of Low. This value can be used in ranking the watershed or individual waterbodies for grant funding under state and county programs.However, all waters are affected by diffuse pollutant sources regardless of initial water quality. Applications for specific runoff projects under state or county grant programs may be pursued. For more information, go to surface water program grants. Garden Lake is considered a Shallow Lowland under the state's Natural Community Determinations.